Location of Hanönü within Turkey. 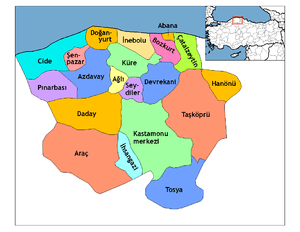 Hanönü, also Gökçeağaç, is a town and district of the Kastamonu Province in the Black Sea region of Turkey. According to the 2000 census, population of the district is 5,545 of which 2,451 live in the town of Hanönü. The district covers an area of 359 km2 (139 sq mi), and the town lies at an elevation of 487 m (1,598 ft). ↑ Turkish Statistical Institute. "Census 2000, Key statistics for urban areas of Turkey" (XLS) (in Turkish). Retrieved 2008-11-02. ↑ GeoHive. "Statistical information on Turkey's administrative units". Retrieved 2008-11-27. ↑ Statoids. "Statistical information on districts of Turkey". Retrieved 2008-11-27. Falling Rain Genomics, Inc. "Geographical information on Hanönü, Turkey". Retrieved 2008-11-02.